You may not think you need another iOS weather app, but you should consider downloading the Climate Clock iPhone, iPod Touch, and iPad app. It gives you quick access to hourly weather conditions and a ten day forecast with simple gestures. The Climate Clock iPhone app uses a clock with moving hour, minute, and second hands to provide an easy frame of reference. 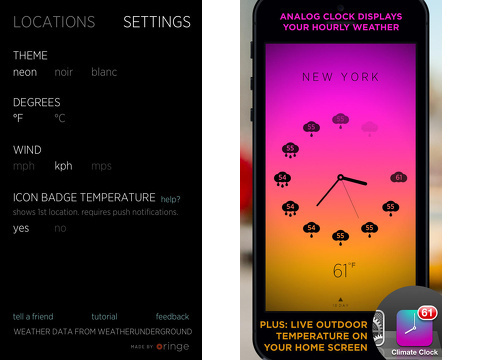 The Climate Clock iPhone app opens with a tutorial screen that outlines the gestures. You tap the screen in any location to change the conditions for each hour between temperature, precipitation percentage, and wind speed. You add locations by a long swipe to the right. You access settings with a long swipe to the left side of the screen. Quick swipes move between each saved location. You swipe up from the bottom of the screen for the ten day forecast. You authorize location services, and your screen changes to a large clock. In each hour’s location, you will find an icon to describe the prevailing cloud conditions and high temperature predicted for that hour. Just below the clock, the current temperature is displayed. When you tap to change to precipitation and wind speed, the cloud condition icon remains and the value changes to reflect the possibility of rain and snow and the projected wind speed. The projected ten day forecast slides from the bottom of the screen. It is a matrix with the predicted cloud conditions, high temperatures, and low temperatures. Just below the icon for each day’s conditions, the high temperature is displayed in bold type with the low temperature in smaller, plain font. This simple interface gives you a complete picture, but you access it without the hassle of multiple clicks and refreshes on weather.com. 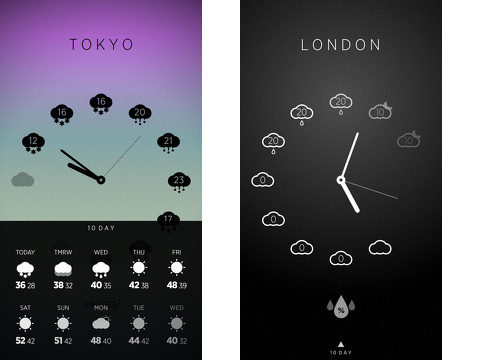 The Climate Clock iPhone app fills a need to have an hourly reference of weather conditions to plan for daily tasks. You can get in a run with no rain in the morning, or you’ll battle wind and rain in the evening. For the unusual, extreme weather I have experienced this winter, it is a great tool to help me know when to set my heat pump to emergency heat and let faucets drip to prevent frozen plumbing. The Climate Clock iPhone, iPod Touch, and iPad app is particularly helpful for those who – like me – live in areas with dynamic, changing weather. I actually use three – one with radar, one that indicates how quickly weather conditions may change, and this hourly forecast tool. This is my favorite hourly forecast tool for its ease of use and simple interface. AppSafari review of Climate Clock – Minimal Hourly World Weather Forecast was written by Jenni Ward on February 11th, 2014 and categorized under App Store, iPad apps, Universal, Utilities, Weather. Page viewed 4785 times, 2 so far today. Need help on using these apps? Please read the Help Page. Wow, very usefull app, I used a lot!